Today I'm going to talk about the phrases 'want to' and 'going to'. 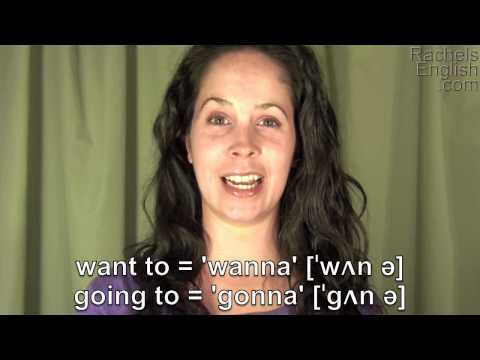 Wanna and gonna are acceptable, although casual, pronunciations of these phrases. For example, in a job interview, you might not want to use this more casual pronunciation. You might say a phrase like, 'I want to contribute ... blah blah blah.' Want. Where you actually make that T sound. But if you're in more casual conversation, for example with a friend, you might say something like 'I want to be there by 6.' Wanna, wanna, here it would be appropriate to use that word. In the words wanna and gonna, it is the first syllable that is accented. Wanna, gonna. And the vowel sound in the first syllable is most likely going to be the 'uh' as in 'butter' sound, though you may at times hear it a little closer to the 'ah' as in 'father' sound. I think I myself pronounce it closer to the 'uh' as in 'butter' sound. Wanna, gonna. In both of these words, the final syllable is a simple schwa sound, short and unaccented. Wanna, gonna. Another note about 'wanna', wanna is short for the words 'want to'. Not ever for the words 'wants to'. So, for example, in the phrase ' I want to be there by 6', I'm replacing 'want to' with 'wanna'. But if we change the subject to he, he wants to be there by 6, now the word is wants, with the S, and not want (because of the different conjugation). Therefore, we cannot shorten it into 'wanna'. He wanna be there by 6. Can't say that because 'wants to' does not shorten into wanna. Only 'want to'. Going to, or gonna, is used with a subject and the conjugated verb 'to be'. I am going to be there at 6. If we're going to shorten 'going to' into gonna, we're also going to want to shorten 'I am' into I'm, a contraction. I'm gonna be there by 6. You are going to becomes you're gonna. He or she is going to becomes he's gonna, she's gonna. We are going to becomes we're gonna. They are going to becomes they're gonna. They're gonna. If you're going to be shortening these words, they're, the contraction, gonna, the more casual pronunciation, you don't want to pause between them. They're gonna, they're gonna. The whole point in shortening them is to say it faster. So, if you pause in between, it will make the sentence sound a little strange. They're gonna. We're gonna. I'm gonna. It all melts together, almost as if it's one longer word. Repeat the following sample sentences. I want to see the movie on Friday. They wan to be here. We want to get there early. I'm going to see her tomorrow. Are you going to be there? They're going to pay for it. We're going to stop by later.